Welcome to the Grady College AATC (Adobe and Avid Authorized Training Center). Founded in 2009, the center offers certified instruction on Avid Media Composer and Adobe Premiere. With a facility featuring the latest versions of each software, lead trainer Professor James Biddle provides basic and advanced level courses for professionals, as well as, UGA staff, students, professors, seeking a new or advanced skill set on one or more of these NLE (Non-Linear Editing Systems). The Grady College AATC is located in Room 136 of Grady College of Journalism and Mass Communication. Featuring up-to-date IMac systems and a large screen viewing system, the center teaches up to eight people per course. 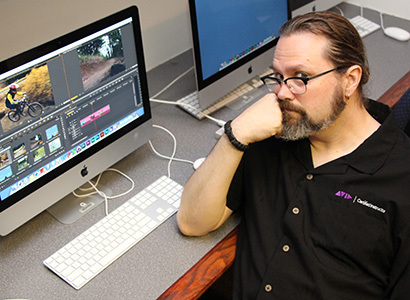 With 20+ years of post-production & sound design/recording experience, and over 10 years of certified instructor experience, Professor James has taught certified courses on Avid Media Composer, Final Cut Pro Suite, Final Cut Pro X, Adobe Premiere, and many other NLE, sound, DVD design, and color correction applications. Professor Biddle, a graduate of Syracuse University’s S.I. Newhouse School of Public Communications, has taught classes in sound design, single camera production, and post-production at the Grady College of Journalism and Mass Communication since 2006. Professor Biddle also works as a freelance contract Adobe Premiere for Sterling Ledet & Associates, as well as a contract Adobe Premiere Trainer for Turner Studios. To send a direct email to jbiddle@uga.edu or call 706-224-4604. As part of Adobe Systems Creative Cloud, the subscription service giving users access to graphic design, web development, photography, etc., Premiere Pro provides the video editing hub for the cloud system. Offering integration with Photoshop. Prelude, After Effects, and other Creative Cloud Applications, Premiere Pro provides tools for independent producers, broadcasters, and feature works such as Monsters. We offer one official certification course for Adobe Premiere CC. This course is two full days in length. Payment for all certified Avid instruction includes the appropriate, course-approved training materials, and parking passes for the North and Tate Parking Lots. Versions of the software, as well as subscriptions cloud-based systems (Adobe CC and Avid Everywhere) are not included with instruction. The certification test for Adobe Premiere is not included in the cost of instruction. Those wanting to take the certification exam will need to sign-up for a Pearson VUE test at a Pearson VUE Testing Center (approximate cost of $200). We prefer the Amatrace testing center in Atlanta, and the Athens Technical College testing center in Athens, GA. Still considered the dominant non-linear editing system in the film and television industry, the Media Composer is the flagship of Avid Technology. Offering strong editing, effects, sound mixing, and color correction tools, Avid Media Composer software and editors have been used on such works as Modern Family, Avatar, The Hunger Games: Catching Fire, and The Avengers. Payment for all certified Avid instruction includes the appropriate, course-approved training materials, two tests, and parking passes for the North and Tate Parking Lots. Versions of the software, as well as subscriptions cloud-based systems (Adobe CC and Avid Everywhere) are not included with instruction. This is a specialty course on how to advance your skills and speed with keyboard hotkeys instead of the mouse. All three systems are covered in this one day course. Professor Biddle’s current obsession is using Adobe Prelude and LiveLogger for interviews, sports, and narrative dailies. While many people say, “Oh, I don’t use Prelude…it’s redundant,” those people do not understand the full power of what these two applications can do. This one day, non-certification seminar will show you can tag metadata on multiple cameras at once, transfer notes to camera clips, create rough cuts for Premiere, and encode multiple codecs for editing, compositing, effects, color correction, and creating multiple backups to multiple areas. Another of Professor Biddle’s current obsessions is Avid’s Dynamic Media Folders. This one day, non-certification seminar will show you can use DMF’s to transfer notes to camera clips, encode multiple codecs, create multiple backups to multiple areas, and re-evaluate how to do DIT on-set. Payment for all instruction includes the appropriate, course-approved training materials and parking passes for the North and Tate Parking Lots. Versions of the software, as well as subscriptions cloud-based systems (Adobe CC and Avid Everywhere) are not included with instruction. If you, or your group is interested in certification or non-certification training, check the training session calendar for available sessions. If you want to schedule a session with the lead trainer, send a direct email to jbiddle@uga.edu or call 706-224-4604. To talk about certified and non-certified training costs, email Professor Biddle. Grady College is located between Baldwin & Hooper Streets, and Sanford Drive and East Campus Road. Sanford is a one-way street going toward Baldwin Street, so be careful. The entrance to the training center is located on the corner of Hooper Street and Sanford Drive on the Sanford Drive side. For weekend trainings, the doors into Grady College are locked. Professor Biddle will send instructions on how to enter the building on weekends. For weekday sessions, trainees should park in the North Deck on Jackson Street, or the Tate Deck on South Lumpkin Street. The AATC will provide parking passes for these lots for each day of training. For weekend sessions, you can park for free in the Grady College Lot, N08, or in the North Deck or the Tate Deck. If you park at Grady College, make certain you park in the Grady College section (with the security arm), not in the Psychology Area.